← Update – Magor & Undy Walkway Station debated in parliament . 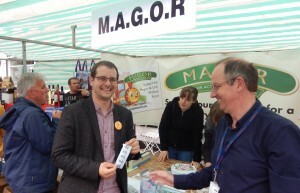 . .
Don’t forget to visit us on our usual raffle stall at the May Fayre. As well as our usual nice selection of prizes, all kindly donated by our supporters, this year we are joined by members of the MUCH group (Magor and Undy Community Hub). They will be able tell you about the latest developments and plans for the Three Fields Site and should have some pictures of the architect’s latest designs and features.